I'm a little late posting this (as I am sick, and just got out of bed! ), but here it goes! 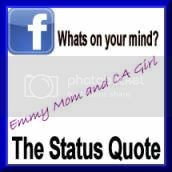 Lourie from CA Girl is hosting The Status Quote and it's pretty fun to read what random people are tweeting/facebooking. I won't say names or locations but here are updates I have enjoyed recently! Head on over to Lourie's blog to participate! Did you know that in this month, there are 5 Saturdays AND 5 Sundays??? Apparently that only happens once every 800 years. My inner nerd says, "COOOOOOL!!!" Google installed software on 7 Toyota Prius' that enable them to drive on their own...I'm down. I hate driving. Tomorrow is my due date and I don't even feel like labor is coming any time soon. Flip. Is it safe to assume that the sequel to Man v Food will be called Man v Heart Attack? I am so blessed beyond measure. Let us all strive to have an attitude of gratitude..I promise it will change your life. There is nothing more terrifying to me than pregnancy and giving birth. Getting tired of neighbor yelling at their 20-something yr old kids. I want to scream out my window, "Get a real job or get the F- out"! Hahaha man I love reading random tidbits from people! Teenagers are way scarier than birth! hahahaha. And so is homework. WHich right now I am avoiding like the plague! Thanks for playing. I hope you are feeling better soon. The Man v Food & Man v Heart Attack was a great laugh! I didn't read this close enough! When I read your due date was tomorrow.. I was all "WOW! I have missed something! Or a lot of somethings!" Then I re-read! I love me some facebook updates! Although I just deleted over half of my friends! haha they are some great updates! I love facebook updates for having a giggle! !